While writing the Orc Romance, I found myself researching place names, particularly in the Saga of the Volsungs, since I have it so conveniently close to hand. King Volsung ruled over a land called Hunland, and his enemy and son-in-law, King Siggeir, ruled over Gautland, a land associated not just with the Saga of the Volsungs, but Beowulf (the Geats of Geatland) and Roman history (the Goths of Gothia). But more importantly, it happens to be bordered by a forest called Tiveden, and the lakes of Tiveden have a Nix. I had never heard of a Nix (aka Näck, among other variations) until I found Tiveden, but now I kind of want to make one into the main character of a story. (Or I would if I wrote fantasy of that kind. Orc Romance not withstanding.) The Nix is the Germanic water spirit, sometimes a merman but mostly a shape shifter, which puts me almost directly in mind of the river gods in Classical myth (especially the story of Poseidon impersonating the river god to get into Tyro's pants). 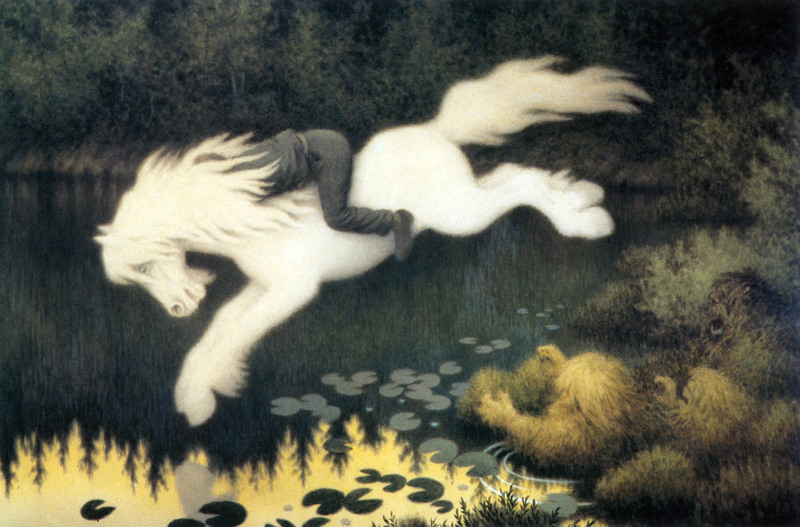 In Scandinavian folklore, they are supposedly great musicians, often appearing as a man with a violin (though their name comes from a word meaning river horse) able to enchant their listeners with their music. They can be jerky, making demands and luring people to drown in the water, or friendly and even willing to teach others how to play as well as they do. And the story of the origin for the red water-lilies in Tiveden forest? It's just heartbreakingly fascinating. Guys, I have not delved deeply into the research (wikipedia so far), but so far, I'm taken. What's your favorite folklore-ish water-related creature? I like the duality that Ind-European traditions (specially on the European side) ascribe both to fire and water. They both nurture but also destroy. Water tends to entrance and lure men to their deaths, whether at the river's edge or in the deep sea. If I had to guess, I would say it was probably because water WAS life and death. They needed water to drink, to travel, to trade, but if someone went out in a ship, you never actually knew if they were coming back. It was their best friend and their worst enemy without any personification or spirits-- but if you gave it a spirit, then maybe you could make an appeal and believe you had a better chance of surviving. Naiads, just because I always envisioned them as being flowy and clear while in the water. Part of the water with swirling, glass-like hair that flowed around them while in clear watery form. I don't know if that's mythologically accurate while they were in their springs/fountains, but I always pictured them that way, like a part of the water whenever they wanted to be. And that they could take human form is awesome. I'd want to be a naiad! I find it interesting that in Greek mythology, there were so many specific water nymphs. Salt water, river, and spring/fountain nymphs at least all were separate types. Nice post as always! I'd never heard of nix before, but they sound dream-like. Shapeshifters who play the violin, sign me up, I'm fascinated!